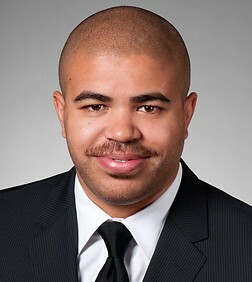 Ben Aigboboh is an associate in the Business Trial and Entertainment, Media and Technology Practice Groups in the firm's Century City office. Ben represents clients in the areas of entertainment, intellectual property and commercial litigation. Ben's entertainment practice includes the representation of studios, producers, and other media companies with respect to a variety of claims, including those relating to content distribution, profit participation and other accounting issues, contract disputes, and other business and production-related issues. Ben's intellectual property practice includes the representation of a number of national and international companies in cases involving trademark (including cases before the Trademark Trial and Appeal Board), copyright and right of publicity claims. Ben has also represented corporate clients involved in business, tort, and consumer class action litigations. A renewable energy company in a tort suit, in which plaintiff sought damages and an injunction that would have led to a loss of more than $2 billion dollars for the client. Mr. Aigboboh served as second chair during the bench trial, examining three expert witness on issues related to the environmental and business impact of renewable energy production in Southern California and drafting all relevant pre-trial and trial documents. Mr. Aigboboh was also responsible for drafting the client's proposed statement of decision, which the court adopted, nearly verbatim, when it issued its 62-page final judgment finding for the client on every disputed issue at trial. An international electronics retailer in a right of publicity suit involving claims asserted by several A-list actors arising from the use of movie stills owned by various film studios, showing characters these actors had played in various films, to advertise the sale of home entertainment products by the client. The case settled favorably. A movie studio in a multi-million dollar accounting dispute involving the merchandising and promotion rights surrounding a well-known character. The case recently settled favorably. As part of the team representing the studio, Mr. Aigboboh was responsible for leading a team of contract attorneys in compiling, reviewing, and analyzing evidence of one plaintiff's major claims, coordinating with the studio to identify relevant evidence and assisting with in-house interviews of relevant actors, in an effort to combat plaintiff's claim effectively. He also assisted in completing an ESI document review involving over one million documents. A hotel in a breach of contract and trademark claim involving the transfer of certain trademark rights to a global beverage company. Mr. Aigboboh served as second chair during the two week arbitration and was responsible for overseeing all aspects of the case leading up to arbitration. An online retailer in a copyright infringement case, which included complex and novel issues related to the Digital Millennium Copyright Act. Mr. Aigboboh served as second chair during a jury trial in the Southern District of New York, drafted and successfully argued motions in limine and jury instructions, and examined adverse witnesses at trial. The jury returned a favorable verdict. A leading global entertainment company in a suit in which the entertainment company claimed trademark and copyright infringement of one of its tent-pole movie franchises. Mr. Aigboboh was involved in all aspects of the lawsuit, including preparation for trial in federal court. The case settled favorably on the eve of trial. A film merchandise company in a right of publicity suit in federal court involving claims by an actor in well-known holiday film. Mr. Aigboboh was tasked with preparing the case for trial. The case settled favorably on the eve of trial. Several large retailers in cases involving claims arising under the Song-Beverly Act. Each case has been settled favorably.